Multilingual Employee Self Service (ESS) for Sage HRMS is a valuable add-on for any company with a large workforce. With today's multi-cultural work environment, it is important to present employees with information in their preferred language. CA-Plus' ESS Language Overlay allows each employee to choose their language for ESS from within their own web browser. Available in French, Spanish or both, this application allows employers to increase employee satisfaction and meet local language regulations. Other languages can be made available. Please contact CA-Plus for details. Easily deployed, employees can install the application on multiple computers allowing them to access ESS in their preferred language from home, work or on the road. 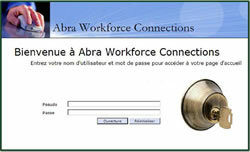 This application does not change any information in the database, but rather changes the field labels displayed to the employee. Labels can also be further customized to meet your specific ESS requirements. The application is compatible with Sage HRMS and Sage Accpac HRMS V8.3 and higher and Microsoft Internet Explorer V6 and higher. 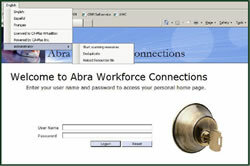 This toolbar was developed to create a language overlay for Sage HRMS Workforce Connections (AWC) - Version 8.30. It is compatible with Internet Explorer only. The toolbar will not change any text coming from the database. Only labels can be changed. Some labels are embedded inside images, so language dependent images will have to be created for a language other than English. CA-Plus will keep track of all the generated licenses. If a Custom Menu that points to an external URL is created "Within AWC Frame", then an error will be raised when accessing the menu. Custom menus must be created using "New IE Window" instead. We cannot guarantee the toolbar is going to work in all scenarios. When other toolbars and add-ons are installed in IE they may conflict with this toolbar.